Wow, nice to read about Maoists being defenders of civilian control over army. 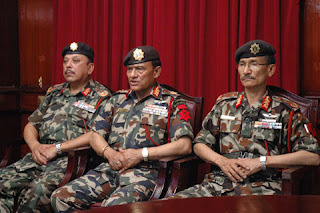 If the old Nepal army was primarily to fight the Maoists and protect the royals (both India and China need only send a fax to take over Nepal), now that both are not 'enemies', why does Nepal army need another 20-30,000 fighters? Unless the intention is to turn them into a taxpayers burden while they still carry on the Maoists agenda of eventual gun-point dictatorship? Isn't that intention absolutely clear from the video of Prachanda? China is trying to control Nepal through Maoists just as it is trying to turn India into a toothless puppet state through the Stalinists. Wonder why China's call for a nuclear free 'South Asia' which essentially means India should give up nuclear weapons even as PRC keeps them (and distributes them to the jihadi terrorist dictators of Pakistan as and when required) figures prominently in the Stalinist election manifesto? I understand that Indian officials held a meeting with Nepal's army chief following the incident but that could also be to help defuse the situation, not merely an expression of support for his defiance, could it not?